DeMatha has one of the top high school football teams in the country. Could a key to their success lie in a non-traditional workout program? RIVERDALE PARK, Md. — It’s a hot summer morning, the air already dripping with dread for the triple-digit heat index to come. You’d think it would be the perfect day for an indoor workout, and normally you’d be right. But this workout studio comes with a twist — half the participants are bulky teenagers, and the thermostat is cranked up to 104 degrees. Many people have heard of Bikram or “hot yoga,” but at Bikram Hot Yoga Riverdale Park, the same principle is applied to Pilates and other classes as well. That’s what a group of about 20, including roughly 10 DeMatha Catholic High School football players, are here to do — one hour of high-intensity exercises in the stifling heat. It’s the second year that the team has been using the non-conventional training method, adding Pilates to the repertoire after starting with Bikram last year. The basketball team at DeMatha was actually the first to try yoga, and head football coach Elijah Brooks thought there might be some value in it for his team, as well. So, he tried it first. It can be particularly difficult for football players, who tend to have compact bodies, and who often focus on building strength rather than flexibility. That’s where Kendra Blackett-Dibinga’s programs come in. The routines also offer the chance to strengthen an often overlooked part of the body in American sports, the back. Then, of course, there’s the matter of the heat. For 10 minutes, your body holds it off. For the next 20, it fights it. Finally, it succumbs to the reality, whether it’s for the 60-minute Pilates class or the 90-minute Bikram class. So how do the two workouts compare for the players? Sophomore tight end/defensive end Alec Solano transferred to DeMatha this year. He hadn’t seen anything like the Bikram and Pilates conditioning before. “When I came to DeMatha, I was surprised with everything that we’re doing,” he said, but is thankful for the experience and is looking forward to continuing it during the season. “I hope so. It really helps us loosen up, be flexible,” Solano said. Jones says he definitely noticed a difference in DeMatha’s opener last season, when they stunned the second-ranked team in the nation, Miami’s Central High School, 38-17 on national television. Coach Brooks noticed as well. 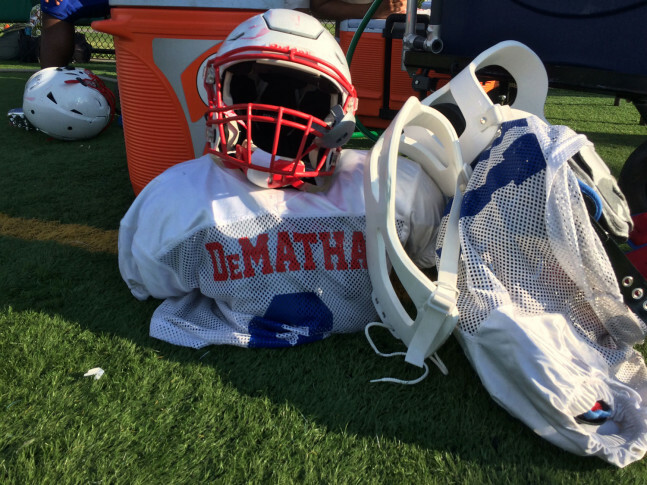 DeMatha opens its season Friday in Chesapeake, Virginia, against Oscar Smith, one of the best teams in the state. The predicted high temperature that day is a balmy 94 degrees. But that’s a full 10 degrees lower than the studio in Riverdale Park, where the team has been preparing their bodies and minds, 90 minutes at a time, for the new season.